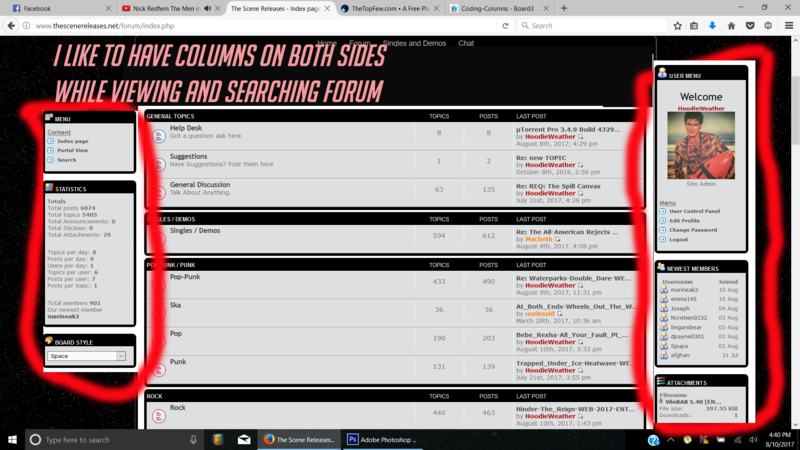 How much time and effort would it be to code the forum itself with both columns showing. As of now you have an option to pick either the right, or left to show. I'd love to show both. If someone wants to tell me how to do It, Ill do it myself. It is possible but not recommended. The general settings in the acp must be set to "Column to display on all pages" on left. There are no further instructions, also think of smaller resolutions. Thanks.. Now, may I ask why its not recommended? As in what? Thanks..
That's the reason why I don't use the side bars. I just use the center. Looks better, and you can add whatever you want. Hey dude, I do see that now, in the forum it's strunk.. where would I be able to edit the dimensions to make it bigger?